Trazodone And Alcohol: Is It Safe To Take Desyrel Mixed With Ethanol? Trazodone And Alcohol: Is It Safe To Mix Them? The use of spirits with certain drugs can cause unpleasant side-effects that may sometimes even be potentially deadly to the patient. Trazodone mixed with alcohol is one such example that patients treated for depression need to be wary of. Trazodone alcohol interaction can range from a slight elevation of side-effects associated with both substances to more severe symptoms that could be potentially life-threatening. 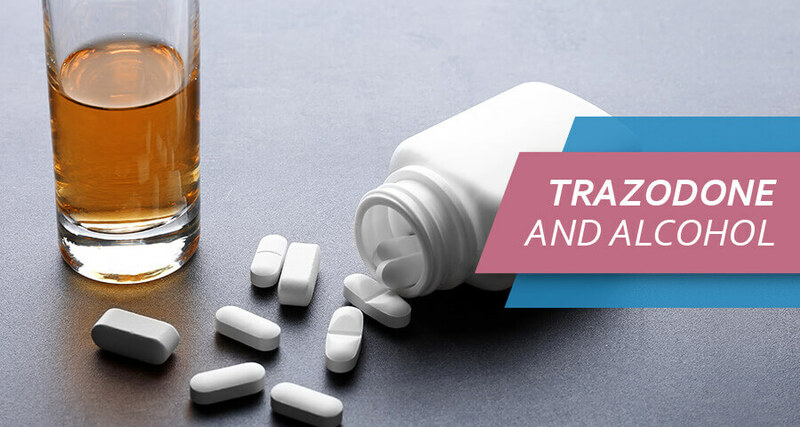 This post looks at whether Trazodone & alcohol should ever be mixed, as well as what happens when the two substances are used together. How Does Trazodone Interact With Alcohol? 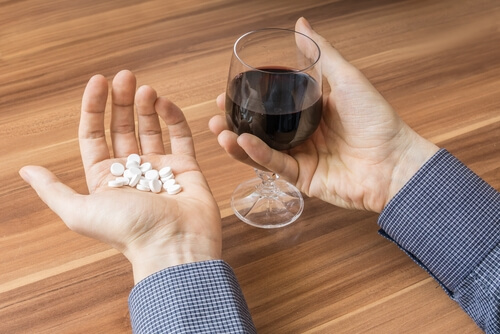 What Are The Dangers And Side Effects Of Trazodone And Alcohol? Can One Die From Trazodone And Alcohol Mix? Is Trazodone Used For Alcohol Withdrawal? Is Trazodone And Alcohol Overdose Possible? Is There Any Safe Amount Of Alcohol That Can Be Consumed With Trazodone? Alcohol And Trazodone: How Do They Interact? Just as mixing drugs like Trazodone and Ambien can cause interactions, so can side-effects occur when drinking on Trazodone. For individuals wondering what Trazodone does – the drug is approved by the FDA for the treatment of depression. The issue with mixing such a drug with spirit beverages is that this antidepressant drug can worsen the way that liquor affects a patient’s body. This causes a significant increase in the risk of experiencing more severe side-effects that are associated with intoxication. A patient who uses spirits with this drug will feel intoxicated faster, and the effects of liquor will be significantly enhanced. 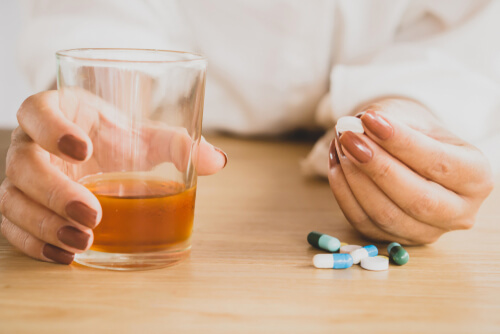 The primary issue that comes to mind when it comes to discussing Trazodone and alcohol side effects is the fact that the pharmaceutical drug causes the results to become worse. Alcohol tends to cause side-effects such as light-headedness, nausea, and a patient often finds that they lose their sense of coordination. When combined with the drug, these effects all become worse. Additionally, since the patient is now using two types of substances that cause a depressant of their central nervous system activity, there is also a risk that they might abuse either one of the substances. While the drug Trazodone, or the Desyrel generic name, is generally considered a much safer option when compared to many of the other antidepressants that have been approved by the FDA, it should be noted that there some dangerous risks associated with using the drug along with alcoholic beverage. Since both affect a patient’s central nervous system, as well as respiration, when there is an overdone, potentially life-threatening complications may occur. Taking Trazodone with alcohol also raises the risk of developing a condition known as Serotonin syndrome. This condition refers to a significant elevation in serotonin levels within the patient’s brain, which can also become life-threatening. Many patients wonder whether Trazodone helps with alcohol withdrawal since the drug is officially approved for depression only. There are cases where it is used for off-label purposes. Off-label use refers to a prescription of Desyrel for a purpose other than depression, which is the FDA-approved application for the drug. In cases where a patient is going through detoxification from drinking dependence, this drug may be used to assist in the management of the withdrawal symptoms that they are experiencing. Trazodone for alcoholism is becoming more popular. Patients can experience many unpleasant side effects when they withdraw from it. Since it is considered a safer option than many other antidepressants, this is often the preferred option. In addition to being useful in treating insomnia as an alcohol withdrawal symptom, the right Trazodone alcohol withdrawal dosage can also assist with the mood irregularities, anxiety, and depressive symptoms that the patient may experience. Trazodone dosage for alcohol withdrawal depends on many factors, such as how severe the patient’s withdrawal symptoms are. Patients may still experience side-effects from the drug, such as Trazodone hair loss. It also needs to be noted that Trazodone causes weight gain in some patients as well. It is quite rare for a patient to overdose on Oleptro, but when this drug is combined with alcoholic beverages, overdosing can occur. Patients should understand that alcohol is a depressant, and mixing it with antidepressant is never a good idea. The body may react on such combination with severe complications. For example, it is much easier to get alcohol poisoning for a person taking antidepressants. And, on the other hand, the regular dose of the medication can prove too high if affected by ethanol intake. When the patient overdoses on either of these, such as taking a Trazodone high dosage, then they may experience possibly life-threatening complications. When mixing doses as low as Trazodone 50 mg and alcohol, the patient is still able to experience some side-effects, and the particular impact that drinking has on the patient’s body can still be made worse. With higher doses, there is an even greater risk of side-effects. For this reason, it is generally not advised that the two be mixed at all. There is no particular amount of ethanol that is currently considered a safe amount for patients who have been prescribed Desyrel assist in the treatment of their depression. There are certain mental health complications that may also occur when using this drug while drinking. It is known that individuals who are experiencing depression, anxiety, and related mental health issues might be at a higher risk of abusing alcohol, as well as becoming dependent when they are taking this antidepressant. This is another crucial reason why it is not advised to drink when prescribed Oleptro. Treatment of the dual addictions, such as co-occurring alcohol and antidepressant dependence require specific skills and experience. However, there are rehabilitation centers capable of coping with two disorders at once. Addiction Resource » Addictive Substances: The Anatomy of Drug Addiction » What Is Trazodone Addiction? Desyrel Drug Abuse » Trazodone And Alcohol: Is It Safe To Mix Them?